What provides energy for the coming work-week requires barreling ahead full-speed on weekends. So utterly wasted are you by Sunday night that there's nothing but sweet oblivion to be found in a deep and desperate sleep. Something living the city course of life doesn't provide, at least for me. Somehow I find Nature knows how best to push the lazy human form from its comfortable life and knock him face down into the living of it. 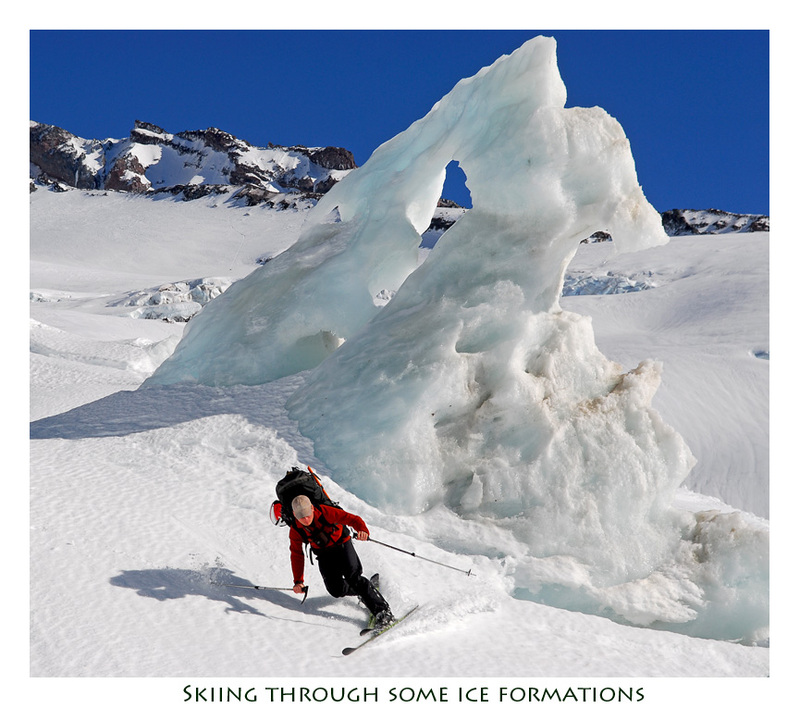 Only then is he focused on what is right there in front of him: star-struck night, mud-cracked glacier, storm-scarred cliff, light-sabered morning, wind-cursed freeze, fist-gripped hunger. They all forge a man stronger and leave him appreciating the homespun amenities like a warm home and plentiful food. 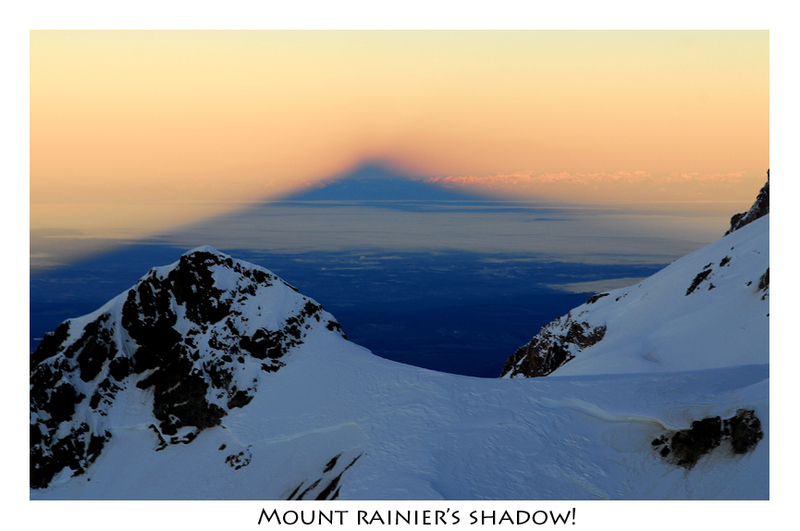 All our worries vanished as dawn cast shadows high on the Tahoma Glacier. It was my goal for the weekend. 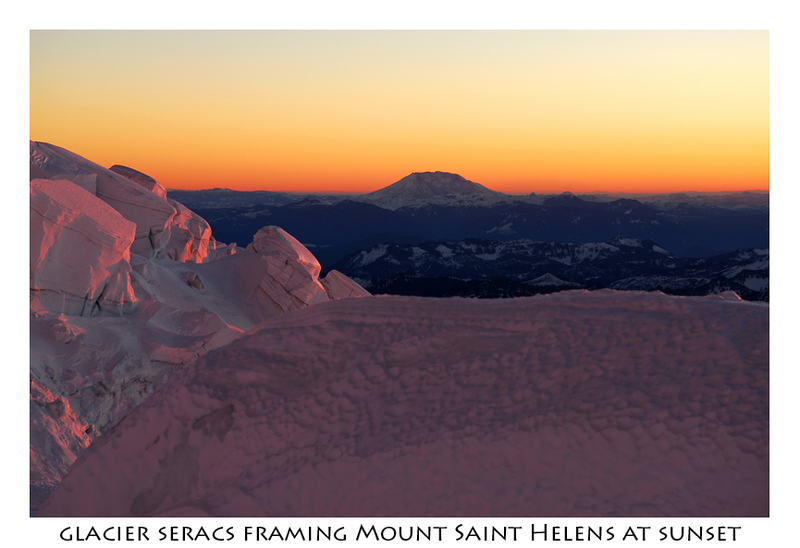 Usually I'd head into the North Cascades, but Mount Rainier, while busy in the summer, provides a remote feel outside Paradise in the winter. With 12,000 Feet of vertical relief, I couldn't think of any place I'd rather be. The glacier itself stretches down; arms reaching toward valleys whose creeks are carved by the same waters that spill from them. 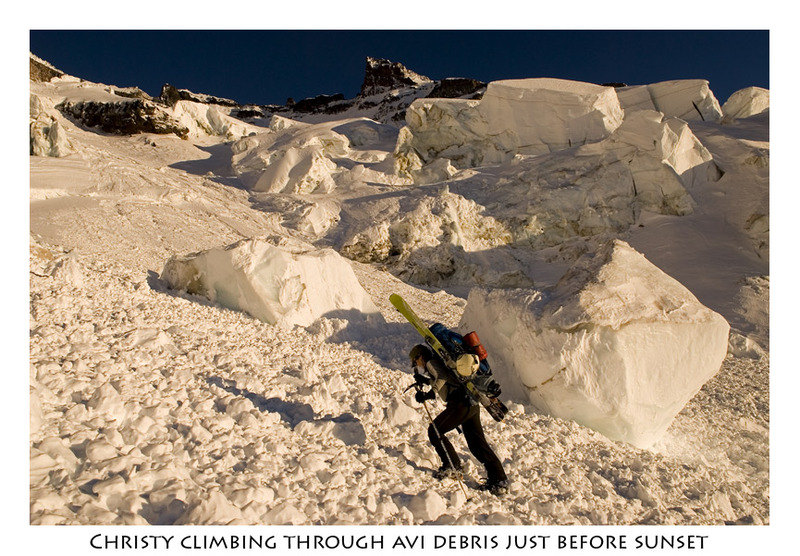 To the sides debris-laden slopes are the leftovers of eons of grinding and sculpting. In every direction, it's continuously coming apart. 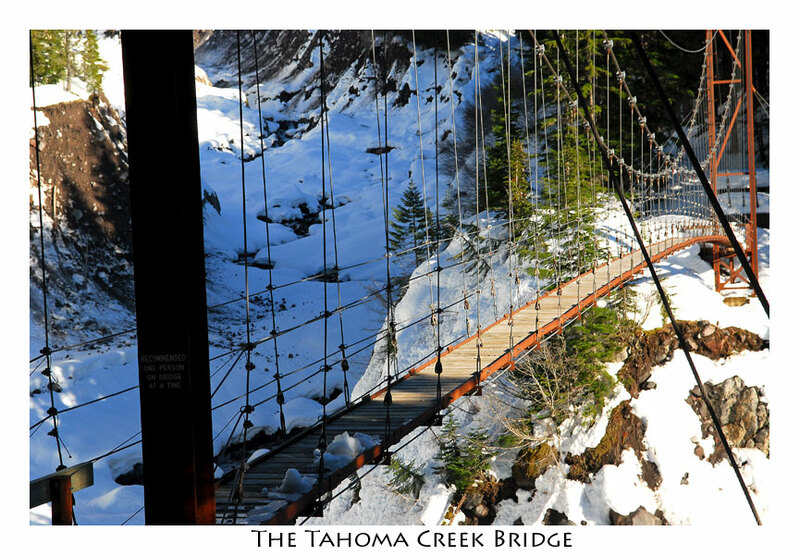 Tahoma creek is not a safe place to be when there is too little snow. We should have gone another way, but there was always enough reason to continue, especially with gorgeous slopes hanging above us. So across the creek, over the creek, and around the creek we went. After awhile we certainly felt like we were UP THE CREEK. 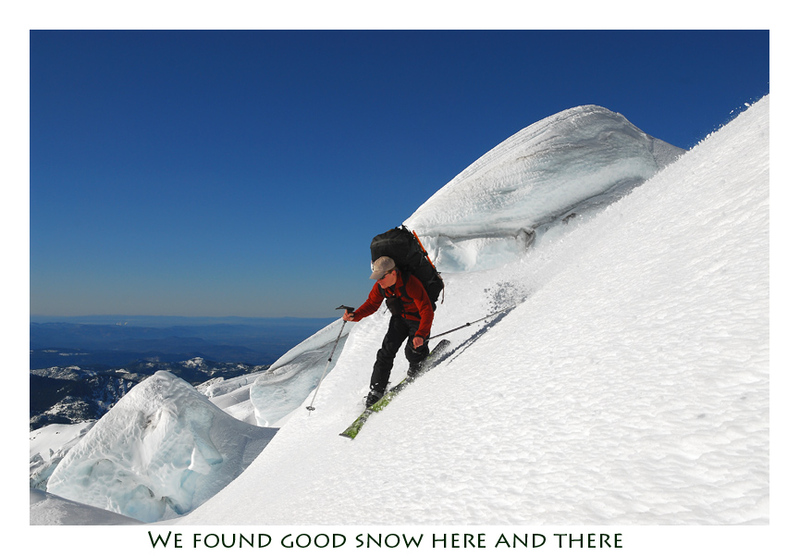 Warm temps and heavy snow, wet feet and just plain annoyance at how things were going nearly turned us around. In hindsight, we could have climbed any of several routes out of Paradise and put in less effort. Everything was against us. It's like when I read trip reports written by someone else who spells out disaster and terrible efforts, then once arriving, find nothing at all. I used to think, eh they're just wimps, but I've learned that a combination of many little things can set even the easiest of approaches into cement-like progress. Case in point, Hannah, who'd been on this route before, had turned around and spent the night with plans to get the heck out of here and her assessment, which she provided us, should have turned us around, too, but it didn't. We knew that she was going to be up here climbing another route and thought we might run into each other. I expected that to be on the way out! Nevertheless, we continued past begging for her to change mind and join us. We left expecting she would continue down the mountain and go climb something else, but no more than 10 minutes later, out from the tree-shadows, we saw a speck of red chasing us down. We all had a good laugh over that. 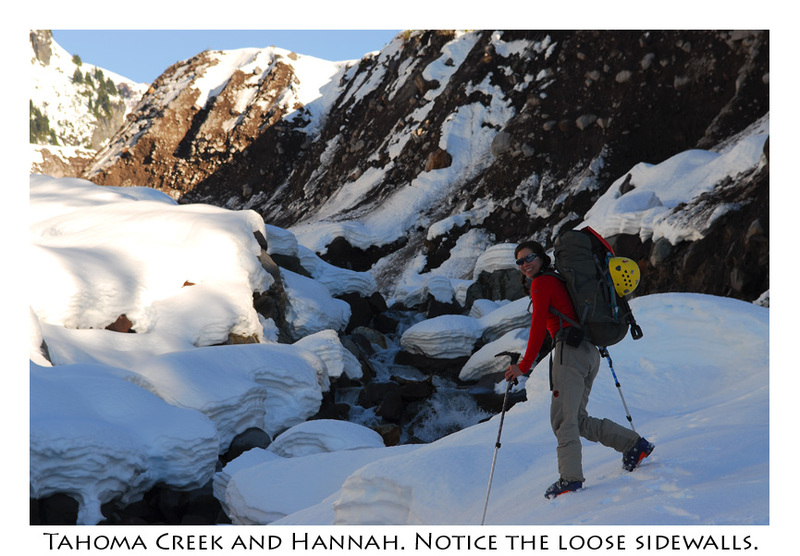 Once we hit another creek crossing, I think Hannah doubted her decision. 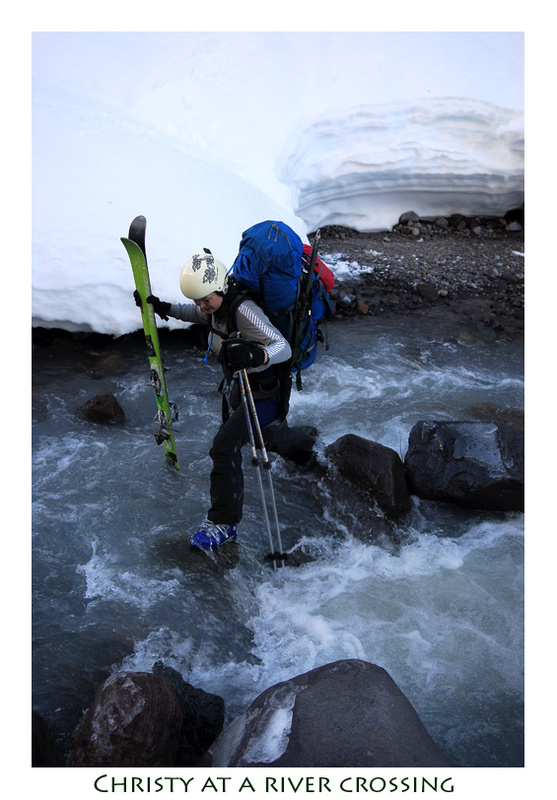 Knee deep in water, Christy must've felt some camaraderie with her and a diminishing pride as she nearly pulled Josh headlong into the boiling, frothy depths of Tahoma Creek, full pack and all. His favorite watch fed the hungry current instead of them. The beast was pacified but my heart practically leapt out imagining gear fishing, 7-ft above the river on rotten snow banks. More shenanigans met us, but we overcame and entered the long-faced slopes drooping down from the glacier, clear of obstacles and speckled with the tops of trees. 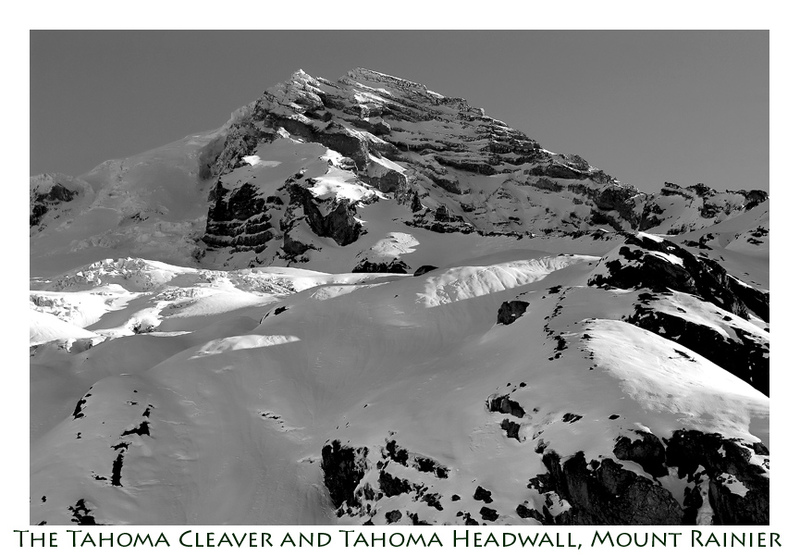 Above us, Glacier Island swam in a sea of snow and ice. Perhaps the name alone is enough to inspire feelings of beauties impractical existence forged out of storm and time. 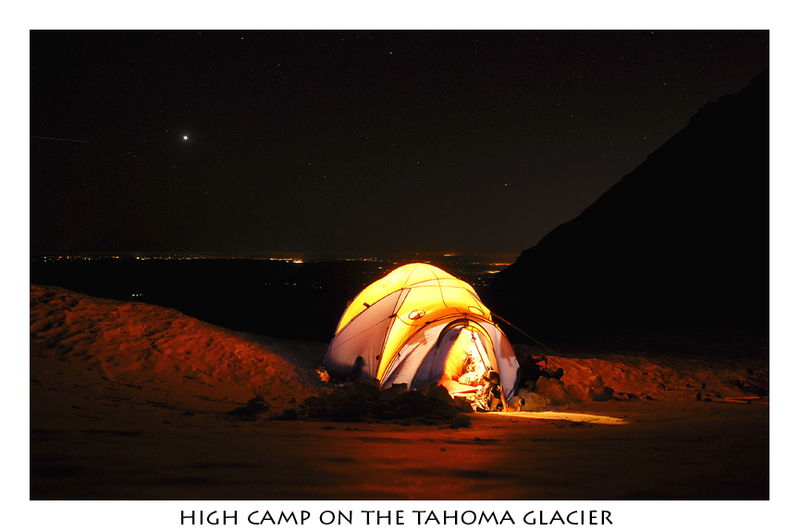 With bleeding glows of a dying day sweeping up the afternoon hours, the last rays of light clung to the slopes until we reached a camp just below Tahoma Glacier. From out in the distance the sun woke without us. 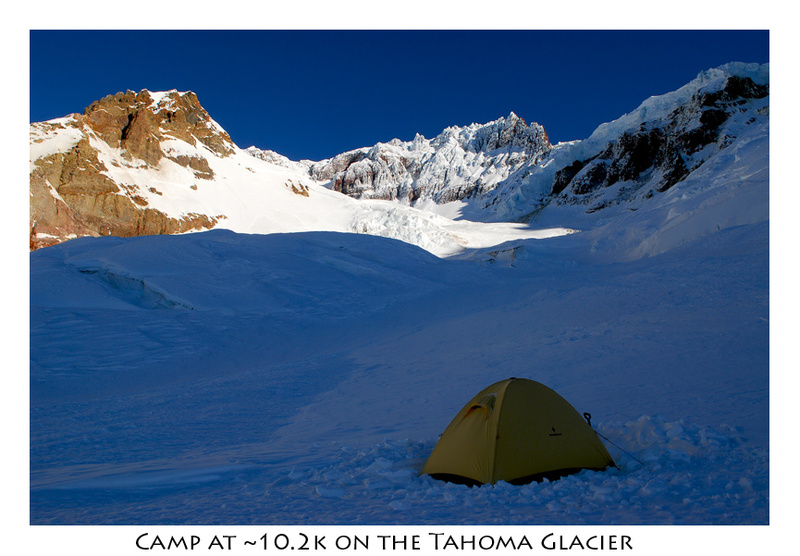 Enough warmth flooded the tent to pull gear, food, and bodies from our nests and set us ahead once more. 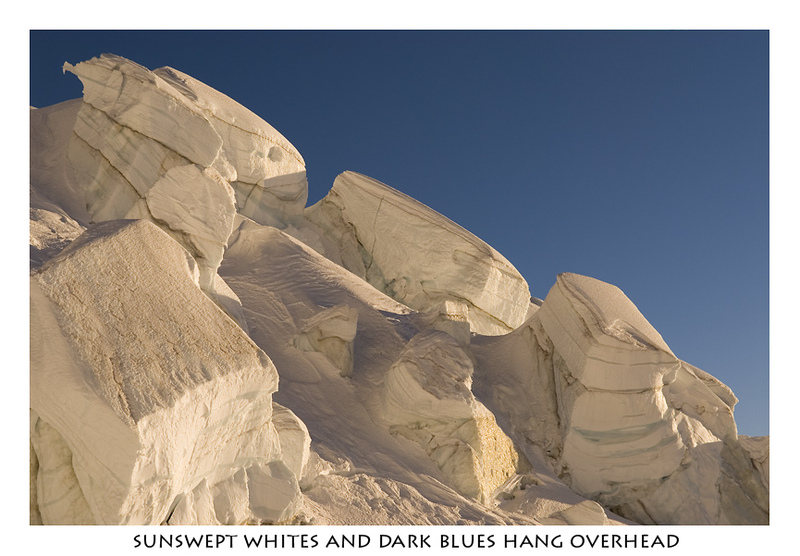 The glacier and sky blues were wonderful. We traversed up a ridge before moving rightward. 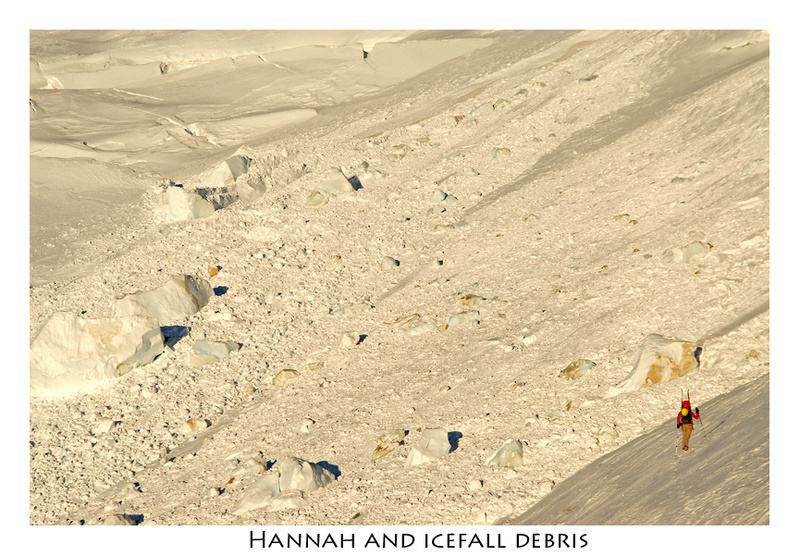 While Josh and Christy had ski-crampons, Hannah and I didn't. These were needed because the snow was terribly icy as Christy discovered as she slipped down the slope, catching her fingers in the snow, which cuts easily. Just to be fair, she wasn't alone. 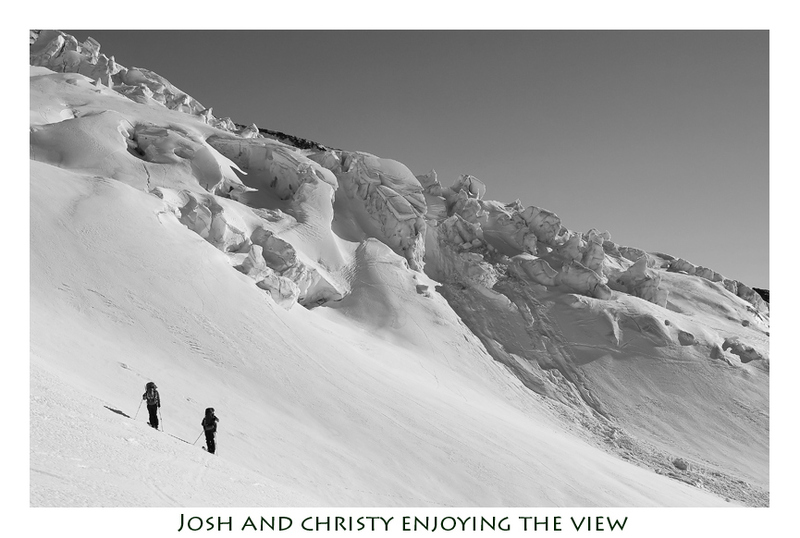 Hannah and I chased Josh and Christy who leapfrogged up the slope while we post holed and cramponed through deep snow and ice. 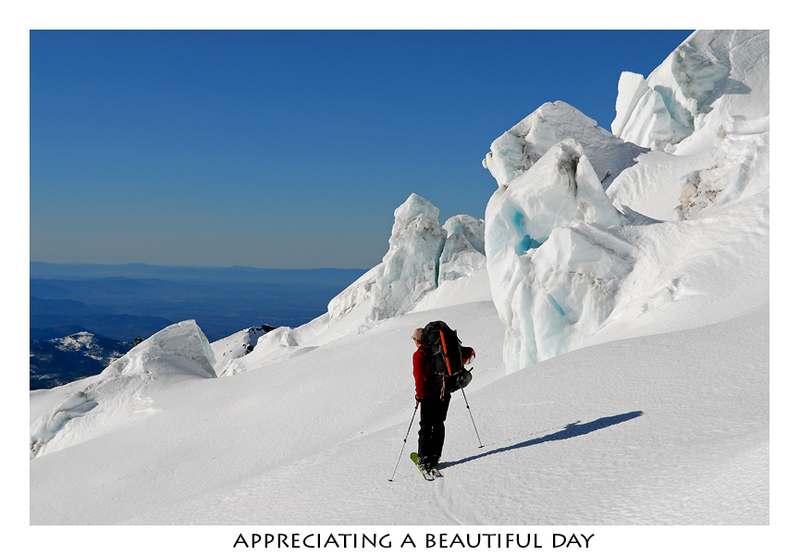 Each of us was regretting not having ski-crampons. Besides climbing, there wasn't a lot that happened between then and our next camp, also found just as the sun crawled under the horizon. 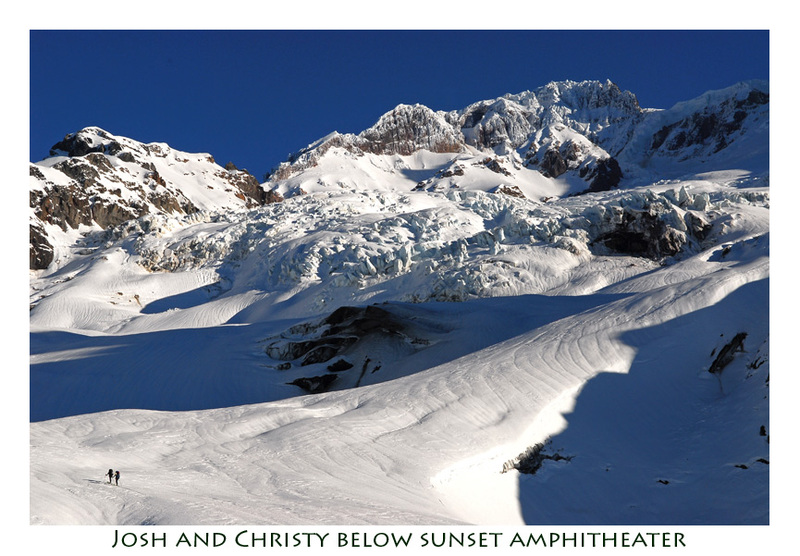 Before darkness, we pitched our tents beneath Sunset Amphitheater, at approximately 10,200-ft. I could imagine no better home for the night. There is nothing like waking up in the middle of the night, to a cold and alien landscape, where blacks and grays swim between crevasses and rolls. The clink of axe and pons, the pulling of rope and harnesses soon come together. Behind us, the stars winked and sparkled as did the city lights. We made fast work of the climbing and had higher hopes than we had begun the morning with as we progressed up the mountain. 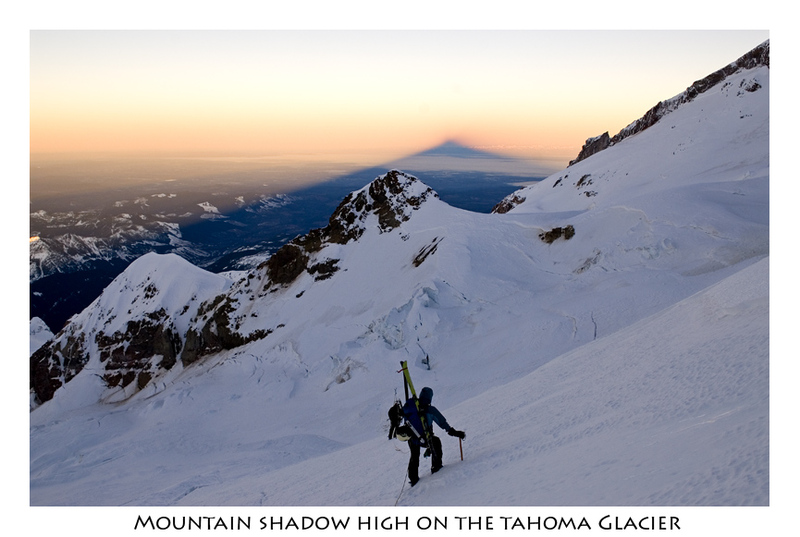 Out from our camp, reaching out for miles, a shadow formed to the west several hours after we began. Like a pyramid, the mountain was painted on the rolling hills. If you haven't seen this before, it is really spectacular! 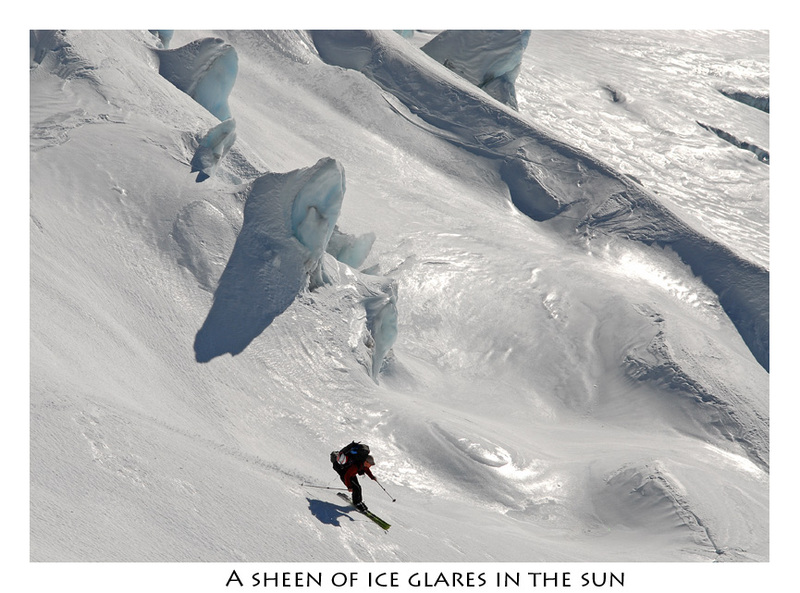 By this time, the glacier had been blown away to ice, leaving us no hope for softer snow to ski. I yelled at Hannah and she climbed up to me. We talked about what we should do. We were worried about the time it would take to climb up and back down, instead of skiing down. We had a long way back and had to get to work. 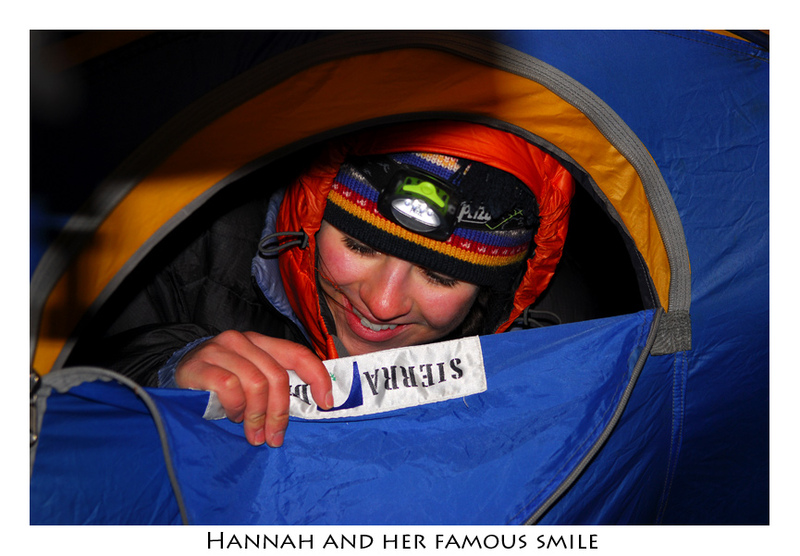 Hannah had no such constraints. Plus she still loves to climb for the sake of it and I guess I do, too. I just like to ski more. 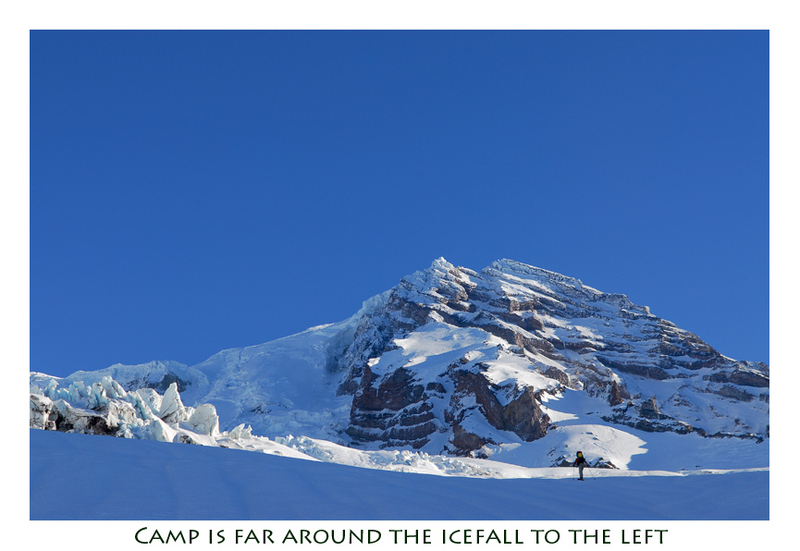 Talking to the others, we agreed and so thereabouts at 12,000-ft, we parted ways. 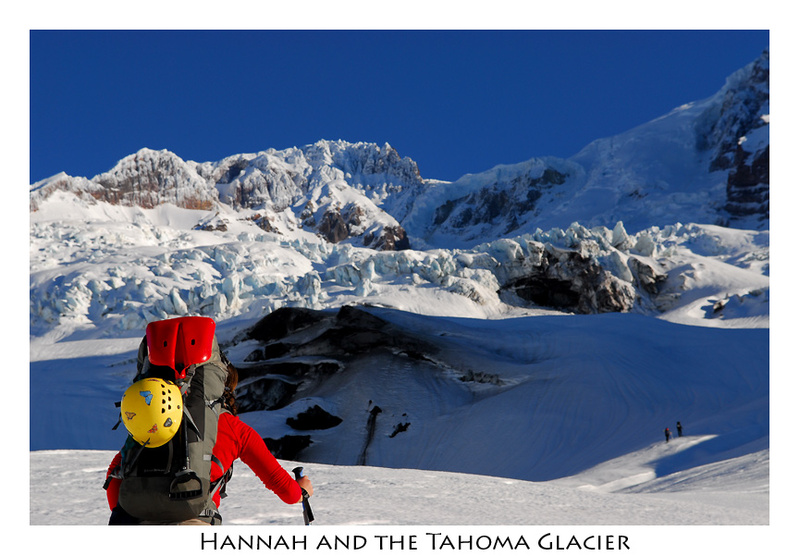 Hannah continued upward and the rest of us climbed down the hard ice and snow to where it was marginally safe enough to rattle ski edges back to camp. 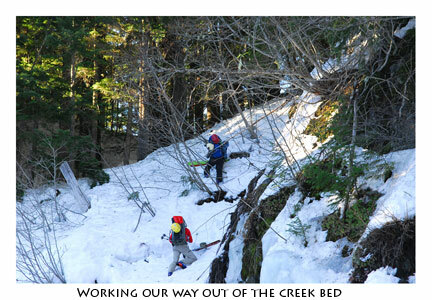 Our skis brought us quickly to camp where a nap was called for. We watched Hannah climb, but couldn't wait for her. Since the day was gorgeous and we knew it'd take time to get out, we started off. With a glance back, I could no longer see the tiny black dot that was Hannah. We took tons of time going down the glacier. 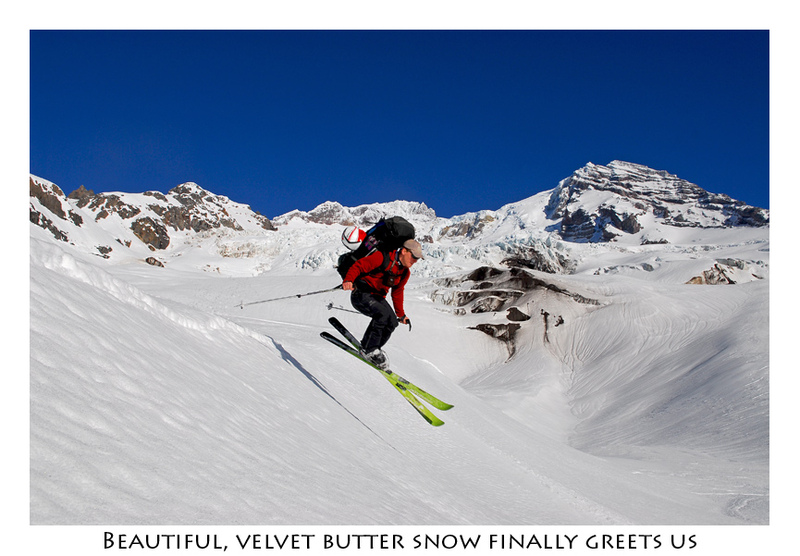 Every rise and aspect was searched out for the best snow. Too many were a sheen of ice. 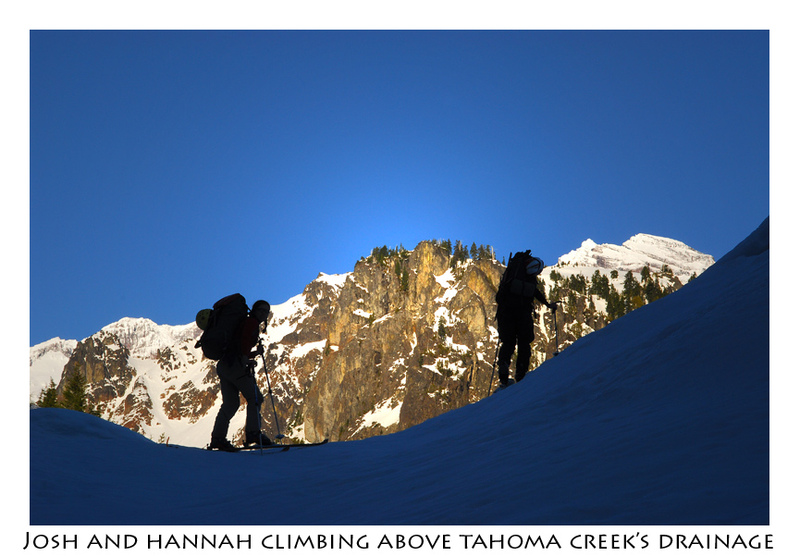 All around there were plenty of cracked smiles and awe-inspired hoots as we rushed down toward the valley and, once again, Tahoma Creek. I'd like to say we learned from the way up, but we didn't. The snow was so sloppy and disgusting. At one point I abandoned a high track for the creek, knowing full well what I'd be submitting us to. Christy, though, for all her smiles and laughing was not so happy when, at one point, she fell into a tree well, perhaps 7-ft down. After climbing up the tree branches, she was able to gather her gear she had tossed from below. By now, after 3 days, she was done and Josh and I were doing everything we could think of to make the way out easier. In the end, thinking back now, I must've made every poor decision possible. 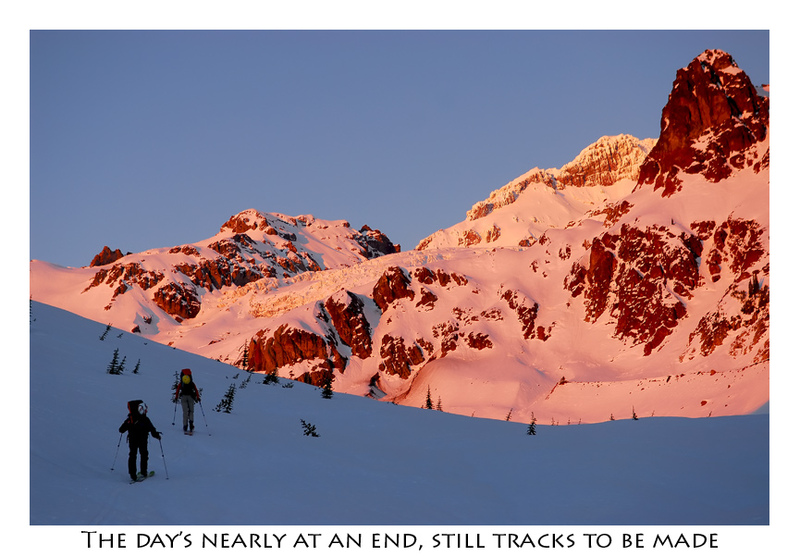 What I realized was this small bit of mountain wisdom: lots of easy choices don't end up making things easier. How that works, I don't know, but it was a good lesson. The worst was when we found the sides of the stream bed had melted. How that we either spend another hour going back and another hour climbing around, or climb the 30-ft up the wall in front of us. I should've chosen option one. Climbing a vertical wall interlaced with rock and clay, was foolish. All the handholds were temporary. We made it over, told ourselves how stupid we were, and then made another half dozen creek crossing. Awesome. 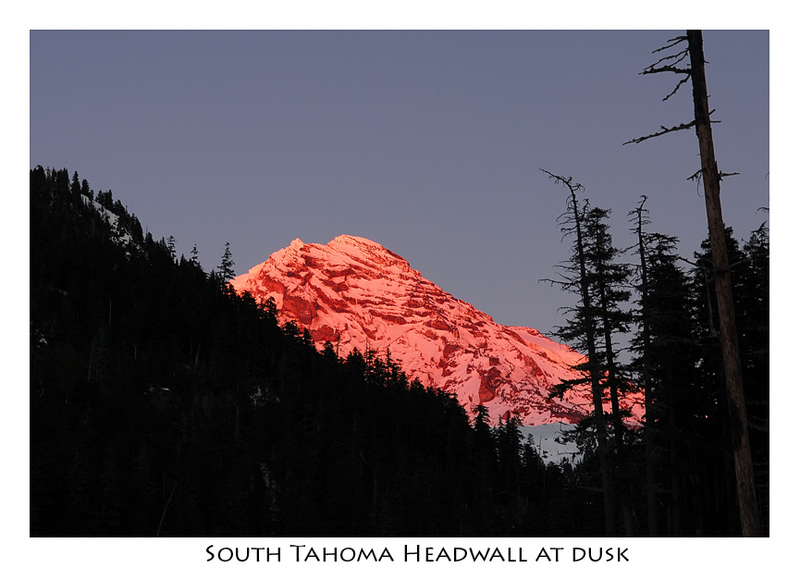 As the sun slipped away for the last time, I skated across the ice rink that had become the stream bed, gliding for a half mile to a corner of the creek where I could see Mount Rainier and the Tahoma Headwall. It was aglow and I was bummed I didn't have a big tripod and a long lens, but I did my best before catching up. 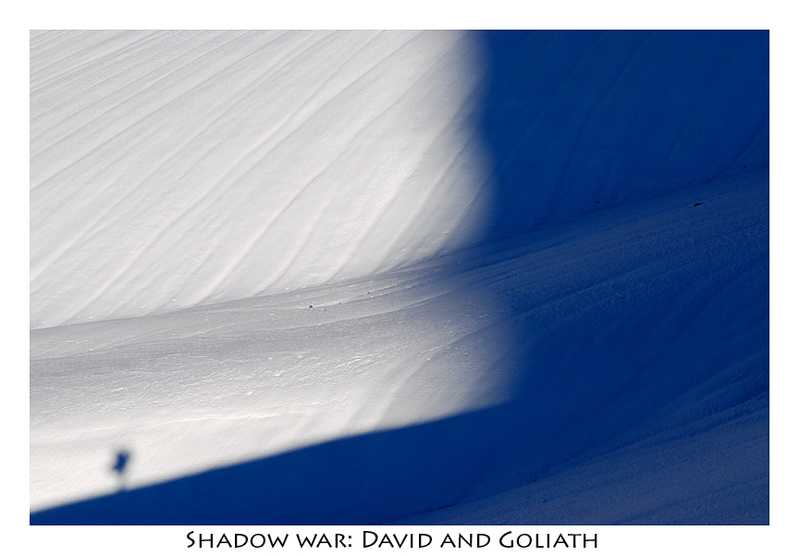 By then, it was pitch black and I could see Christy's tiny light bouncing in the darkness and hear her skis schussing down the slope. While waiting at the end of a creek-spur, I saw Christy barrel headlong into a tree. All I could see was her headlamp pointing in the air. All I could hear were her groans. How darkness changes things. Eventually reaching the road, we met the first of many avalanche piles that were so easy when soft on day one. Now they were rock hard! That night we all busted our asses on those damnedable ice piles! 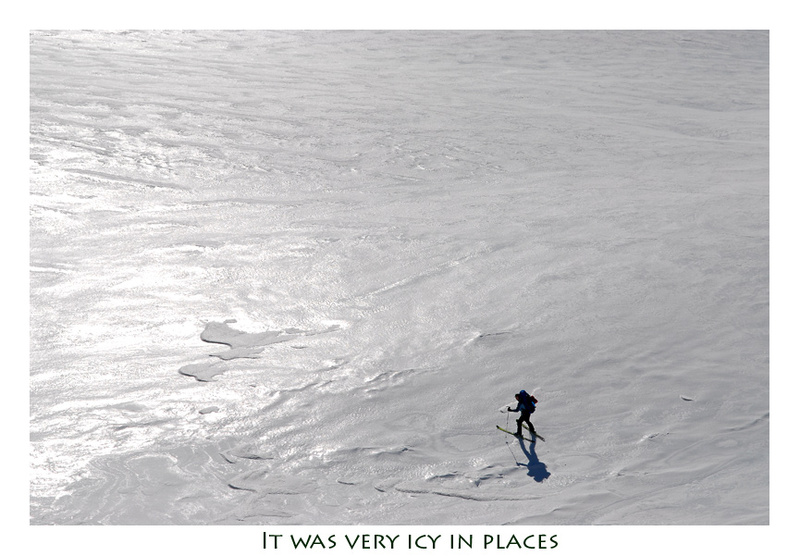 Christy did the right thing by walking over them, but Josh and I still skied. Soon, I fell hard on my side, breaking my ski pole in half. The next 3 miles of road would’ve been easier to skate had I poles to do so. Oh well, I still enjoyed parts of it. The night was brilliant, casting shadows through the trees. Finally a gate and car grew out of the road, instead of more fallen trees, and the trip was at a completion. I looked back and could only imagine Hannah's escape. Hearing of it later, I could only commend her. She and Christy are mountain women for sure. 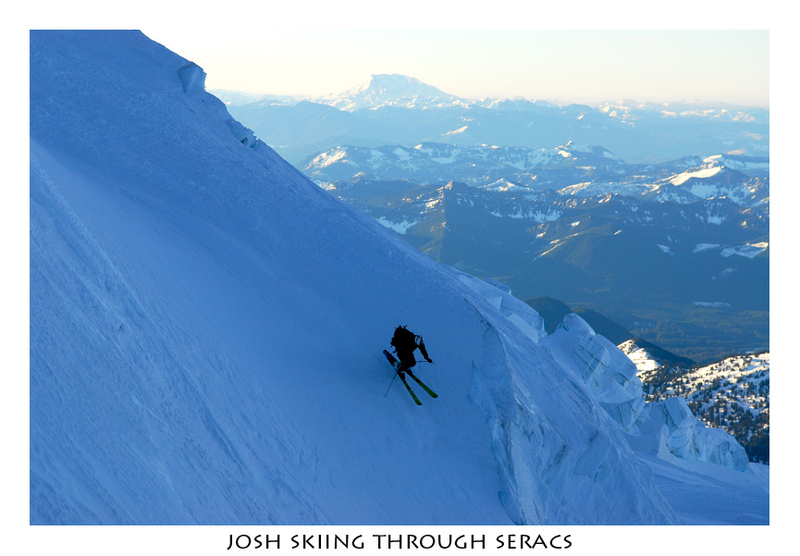 It takes a special breed to deal with the torments that these mountains dish out. For Christy, Josh has submitted her to many tests. This was her biggest, one she'd been begging more than a year for. You can't learn unless you fail and you don't lose unless you let your chin down. Way to keep your chin up Christy! You're a winner. And Hannah, you're an animal. Back in the city, working out at the gym the week after, Christy is approached by a woman who has a very concerned look on her face. She motions to her and says, "Is everything alright at home?" 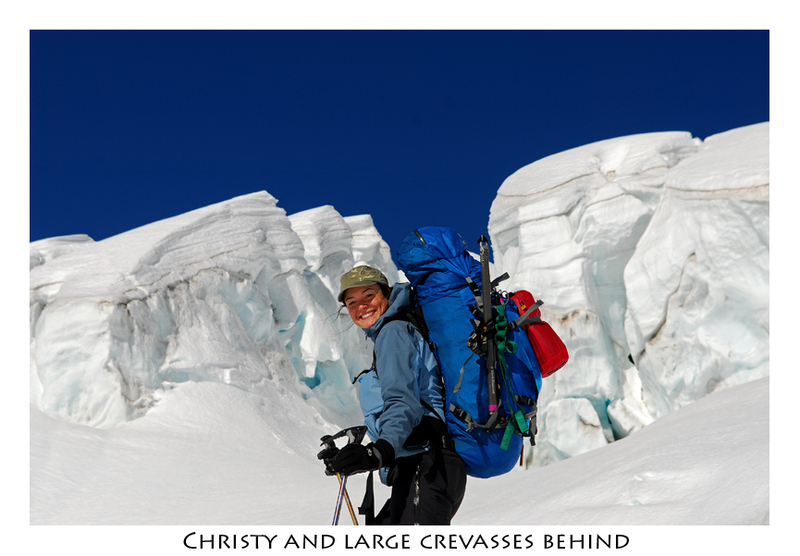 Thinking that her husband was being less than civil, to which Christy laughs and says, "I was just out climbing." This provides an even more concerned look. A black eye (flashlight), bruised arms and legs (trees, tree wells, avalanche debris, and creeks) and ragged look (all the above), what's the city supposed to think? I'll tell yeah. They don't know what to think, but we do. It's our fuel and without it we can't survive. So, until our next adventure. Thanks for coming Josh, Christy and Hannah!! !